Founded in 1994, and located in Mobile, Alabama, Clearbrook manufactures and distributes water filters and food products that enrich and benefit your life. We are committed to innovating new products that are good for your health, help the environment, are long-lasting, and that benefit the customer economically. Clearbrook distributes water filter systems and water treatment technologies for residential, commercial, and industrial customers in the U.S. and around the world. Our mission is to solve the challenge of providing clean, clear, refreshing drinking water and water treatment sanitation systems at home and around the world. We do this by creating innovative products and satisfying our customers again and again. We are committed to providing Better Water for a Better World. In underdeveloped parts of the world, nearly 1 billion people lack access to clean water, and 2.5 billion do not have access to improved sanitation. As a result, 3.5 million people die annually from waterborne diseases. 85% of them are children. Clearbrook is committed to leading the way in reducing disease and poverty by manufacturing and distributing green, sustainable water treatment technologies for individuals, homes, businesses. Clearbrook Foods, a new division of Clearbrook, provides the healthiest, highest quality, flavorful food products from the United States and around the world. The quality and flavor of the food we eat contributes to our quality of life and our health. Certain foods are known to have enriched nutritional value and elevate our physical health, vitality. and overall quality of life. Clearbrook Foods is committed to you and to delivery of the finest products of their kind for your enjoyment. Castillo de Piñar Olive Oil is Certified Organic in the USA and Europe. All claims, labels, and web site content have been submitted and are USDA and FDA approved. Clearbrook Foods will never announce a product is ready for market until everything is considered, validated, approved and inventory is immediately available. Clearbrook values creativity and we consistently invest our resources to build innovative products that are practical and useful and as well as aesthetically attractive to meet market demand for the next generation of water filter technologies and food products. We believe that compromise has no place in technological advancement, or in the design and functionality of our water filtration formulas and food products. Therefore Clearbrook manufactures only products that are good for your health, help the environment, are long-lasting, and benefit the customer economically. We recognize that the satisfaction of our customers will dictate the future of our success, and are completely dedicated to providing high quality products at a great value with timely and professional customer service. Our commitment to customer service is demonstrated with our Satisfaction Guarantee, which provides customers with confidence that our products are superior and reliable. Clearbrook offers resources for learning about water and food. Water EDU is a concise summary of the facts about water, contaminants, and filtration. It includes information about why drinking water matters, what dangers are found in drinking water, what sources of drinking water are available to us, how water filters work, and how to select a water filtration system that is right for you. More resources are coming soon relating to water filters and foods such as olive oil. Clearbrook Filters offers a wide selection of water filtration products for personal and household use, including Clearbrook Water Filter Bottles for outdoors enthusiasts or emergency preparation, Berkey Water Filters that provide drinking water for emergencies or everyday use, Clearbrook Sink Filters and Fridge Filters that last for thousands of gallons of drinking water, and mufti-stage Sink Filters and Whole House Filters for homes that have well water. Clearbrook works hard to develop quality products that stand the test of time. We rely on word of mouth advertising to spread the word about these products. 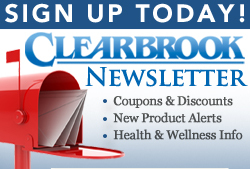 Tell your friends about Clearbrook products. They'll thank you for the referral, and we'll be grateful, too. Clearbrook believes in helping others succeed. Our dealer network provides you with the opportunity to sell quality products at competitive prices. Whether you need a few hundred extra dollars each month, or are looking for a start in a new career, becoming a Clearbrook Dealers can help you achieve your goals. Join today!